Christopher Symons and Michael Tomai were instrumental in establishing the Kappa Phi chapter of Sigma Chi at Embry-Riddle’s Prescott Campus, but have since entered the fraternity's Chapter Eternal. This scholarship, in their memory, is intended to initially provide scholarship funds to active Kappa Phi chapter members. We dedicate the scholarship to all the men and women that have committed their time and effort in the development and continued success of the Kappa Phi chapter. By establishing a scholarship, we will be able to help Sigma Chi brothers to focus on their studies and earn their degrees at Embry-Riddle, furthering the legacy of our fraternity. As the fund grows, we hope to eventually provide scholarships to other Prescott Campus students who meet the criteria, as well as members of the Eta Iota chapter in Daytona Beach. Who are Symons and Tomai? Christopher Symons graduated in 2007 with a bachelor’s degree in Aeronautical Science from the Prescott Campus. He entered its Chapter Eternal while returning home from Coast Guard duty in San Diego on June 26, 2008. Chris earned his chapter nickname “Choo Choo” having worked as a train operator at Disneyland. He was committed to establishing the Kappa Phi Chapter even as he pursued his lifelong dreams of serving in the U.S. Coast Guard and flying. He accomplished both of those dreams serving as an ensign in the U.S. Coast Guard and a first officer for Piedmont Airlines. Michael Egan Tomai is a brother from the Eta Iota chapter at Daytona Beach. He transferred to the Prescott Campus and played a critical role in establishing the Kappa Phi chapter. He led the founding members of Kappa Phi through its first initiation in the fall semester of 2005 when the chapter earned its charter. That same year, Mike commissioned into the United States Marine Corps and served in Operation Iraqi Freedom from 2006 through 2009. After separating from the military, Michael continued to serve his country managing special operations capability research and development in the office of the Secretary of Defense’s Irregular Warfare Support Program. When an undergraduate seeks to join the chapter, he will receive a bid from the active members of the fraternity, allowing the potential member to pledge a commitment to the Sigma Chi fraternity. The current membership of the chapter, active and alumni, is 130. When an undergraduate member of the fraternity graduates, he may enter membership as a Life Loyal. Along with the perks of continued networking, it also gives members benefits to aid in their professional lives. 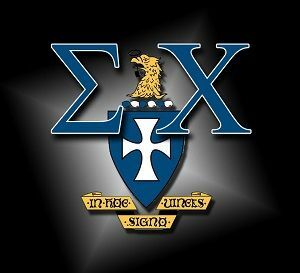 When a brother of the Sigma Chi fraternity passes away, he passes from "our circle to the Chapter Eternal". Family members may allow the fraternity members to perform the White Rose ceremony in honor of the deceased.